I'll meal prep this healthy soup recipe ahead of a busy week and freeze half so I'm stocked for those nights when I just don't feel like cooking (or don't have the time). This is a great recipe for using up leftover veg lying at the bottom of the fridge (because I #lovefoodhatewaste). You can use most veg like tomatoes, carrots, zucchini, onion, pumpkin, sweet potato, potato... I wouldn't recommend using veggies with a high water content like cucumber or cruciferous vegetables like broccoli or cauliflower as it can reduce the shelf life of the soup by quite a bit. I LOVE legumes (aka. beans) and think they are the most underrated health food. I try to eat about 3-4 serves of beans per week because I need a lot of fibre to stay regular (I guess we all do, given the recommendation is to have of 30g/fibre a day!) so having legumes, whole grains and other foods that prevent constipation is a must for me. Luckily, I can eat everything (I don't have any allergies or intolerances) and don't believe in cutting out foods to be healthy. So, this recipe just happens to be naturally gluten-free, dairy-free, low GI, good for diabetes or heart health, parev, vegetarian and vegan. This is a great basic soup recipe. Once you know how it works, play around and make it your own! This is quite a thick soup because I think soup should be satiating and filling. Add more water if you want it to be less salty or stretch a little further. I love adding the smoked chipotle sauce but that is totally optional. I'm sure other hot sauces would be great. Place oil in large soup saucepan on medium/high heat. Place onion in food processor and blitz until small chunks (or chop manually). Add to pan. Brown onion for 2-3 minutes. 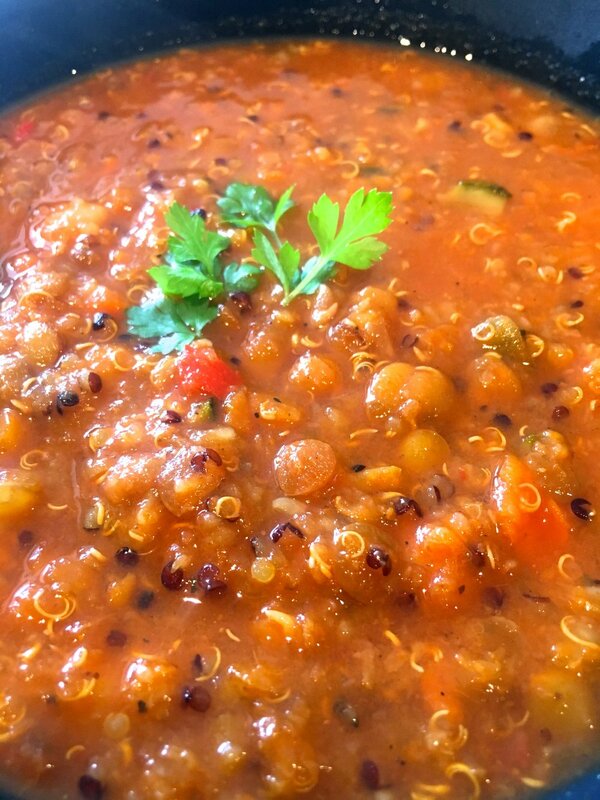 Add quinoa and spices (cumin, coriander, turmeric, pepper) to the saucepan to 'toast' for 5 minutes, stirring occasionally. Meanwhile, blitz veggies (tomatoes, chilli, carrot, zucchini and garlic) in a food processor until small chunks (or chop manually). Add to saucepan and cook for 2-3 minutes. Add passata, lentils, chickpeas and vegetable stock. Add smokey chilli sauce (optional). Bring to the boil then reduce to simmer. Cook for 1-2 hours or until or beans are soft. Add more water if you need to thin it out. Enjoy with fresh parsley! My go-to healthy soup recipe.This is quite a thick soup because I think soup should be satiating and filling. Add more water if you want it to be less salty or stretch a little further. 1. Place oil in large soup saucepan on medium/high heat. Place onion in food processor and blitz until small chunks (or chop manually). Add to pan. Brown onion for 2-3 minutes.2. Add quinoa and spices (cumin, coriander, turmeric, pepper) to the saucepan to 'toast' for 5 minutes, stirring occasionally. 3. Meanwhile, blitz veggies (tomatoes, chilli, carrot, zucchini and garlic) in a food processor until small chunks (or chop manually). Add to saucepan and cook for 2-3 minutes.4. Add passata, lentils, chickpeas and vegetable stock. Add smokey chilli sauce (optional). Bring to the boil then reduce to simmer. Cook for 1-2 hours or until or beans are soft. Add more water if you need to thin it out. Enjoy with fresh parsley!